I've been soaking in everything lately. The biggest thing going on is probably my figure painting class. I've never painted in oil before let alone paint a live figure, so the class is overwhelming but the same time a huge amount of fun. 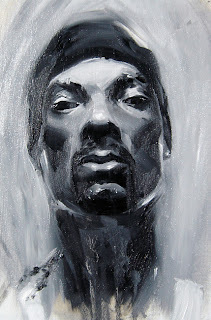 That oil of Snoop was something I did for practice after the first class to mess with the medium. I kid not when I say that I had a cup of water next to my palette before I began the painting. It wasn't till after it did nothing to the paint did I realize my bad...hahaha. The other stuff is from the sketchbook. 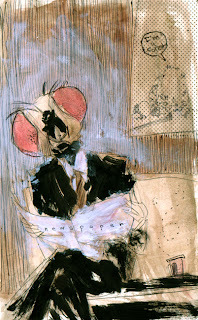 The fly guy is a study for a large illustration I'm working on that I'm real stoked about. Have a good one! very very impressive. i look forward to seeing more work. and thanks for visiting my blog. hey! I wandered over here after seeing your posts on School of Ill a few months ago, but never did comment. 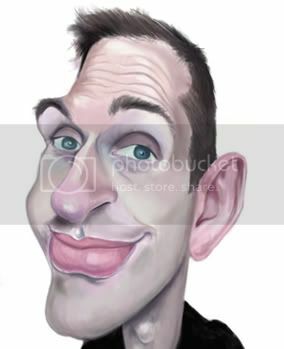 I just wanted to say that I adore your work, and you're a big inspiration to me. Your lines are gorgeous, your characters are genius, and your colors are perfect. You actually got me to buy a moleskin sketchbook, and I love it to death. But I was wondering if I could link to your blog on my own blog and website? I ask everyone before doing so. Thanks, and again, I love all of your work! 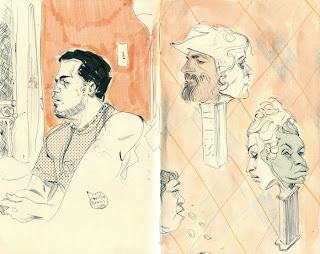 nice assortment of sketches, I esp like the Fly.